We fly on a fairly regular basis, thanks to the thousands of miles that separate us from our immediate families (who are in Wisconsin, Nebraska, Illinois, Florida, California, and Vancouver, BC), and more often than we'd like we're flying with our kids. (It's not that we don't want to travel with our kids. It's that we'd rather they be teleported to our destination so we wouldn't have to fly with them.) I found this article particularly helpful in planning for flying with kids, especially in planning for the trips when I've flown with my two as the only adult. I'm still working on "finding my zen" though. I fear I lost it somewhere over Utah, during our last flight with the kids. 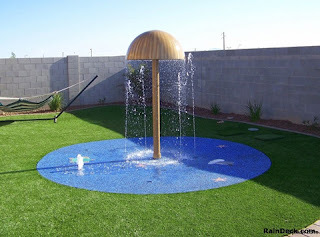 Backyard Splash Pad? Hell Yes! While house hunting in College Station I wouldn't even look at houses with pools. I didn't want to deal with the cost, the maintenance, or the liability, but even more so I didn't want - no, I couldn't - deal with the risk a pool in my backyard would pose to my kids. I know there are ways to keep kids out of swimming pools. But I also know myself, and I know that if I had a pool I would spend every moment when I couldn't see my kids wondering if they'd found their way to the water. It just wasn't worth it. 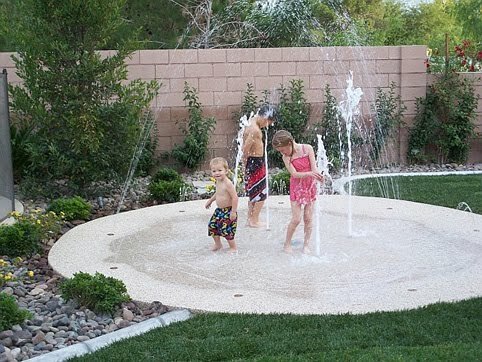 Backyard splash pads! Lower initial and long-term costs, low maintenance, virtually zero risk of drowning...it's a win-win-win-win in my book! Does anyone have one? Thoughts? This post comes a couple of days late, seeing as the 4th of July was two days ago, but in case you have a few fireworks left and are planning to use them this weekend, check out this week's Red Cross post on fireworks and sparkler safety.